Chandikesvara Temple in Hampi is a remarkable temple well known for its impressive architecture. It was built during the period of the Vijayanagara Empire. The temple is situated just by the main road to Hampi. The beautiful temple is dedicated to the Hindu deity Lord Vishnu. It is one of the prominent temples in Hampi and is visited by a large number of tourists throughout the year. The splendid architecture of the Chandikesvara temple makes it one of the most attractive temples in Hampi. Like numerous other structures in Hampi, the Chandikesvara temple showcases the Vijayanagara style of architecture. The Chandikesvara temple stands within a small compound and has a big hall situated at the front of the structure. The most interesting part of the temple’s architecture is the richly carved pillars standing in the front hall. Each pillar is a brilliant piece of architecture in itself. Each pillar has been crafted out of huge stones in an impressive manner. The pillars depict several themes from the Hindu mythology and are a treat for the visitors. The entrance to the temple is decorated with remarkable carvings of Yalis, a fabled creature from Hindu mythology that is part lion, part horse and part elephant. The temple has two shrines located inside its compound. The main shrine is located at the centre. This central shrine contains the sanctum sanctorum of the temple and once had an idol of the reigning deity installed there. However, no idol can be found inside the shrine now. A small shrine stands at the north-west area inside the temple compound. This temple is supposed to be dedicated to the Goddess. Even the small shrine is devoid of any idols. The Chandikesvara temple is one of the few structures in Hampi that has not been completely ravaged. A significant portion of the temple still stands intact. Infact the pillared front hall has managed to survive the devastation unleashed by man and nature through all these years. The beautifully carved pillars have been spared devastation and have managed to preserve a wonderful part of history in their construction. However, not all portions of the temple have survived the devastations. The inner wall of the temple compound had a pillared cloister. Only traces of the pillared cloister remains today. 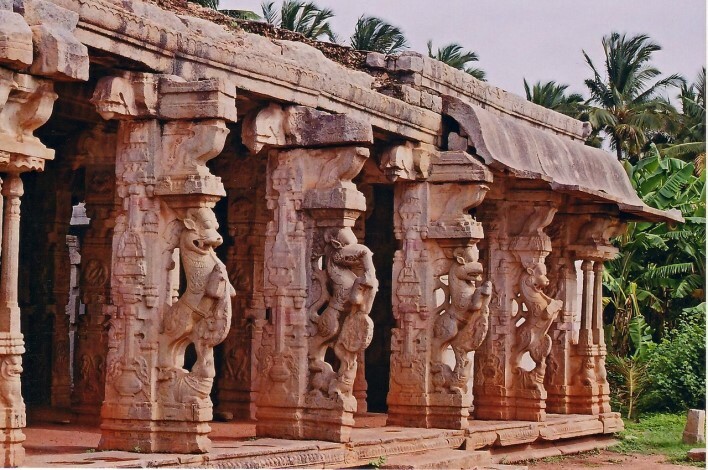 Though the temple is not in great shape and has suffered some amount of damage, it still reflects the skilled craftsmanship of the workers of the Vijayanagara era. The Chandikesvara Temple is one of the well known temples in Hampi and can be easily spotted while passing through the main road to Hampi. It can be easily reached from all parts of Hampi. Hampi is a ruined town that does not have an airport of its own. The nearest town to have an airport is Ballari (Bellary). Visitors can take a flight to Ballari and then travel by means of local transport to reach Hampi. Ballary stands at a distance of about 64 km from Hampi. Hampi has no railway station of its own. The nearest railway station is located at the nearby city of Hosapete (Hospet) that has the Hospet Junction Railway Station. Hosapete stands at a distance of around 10 km from Hampi. To reach Hampi from Hosapete one can take a bus or avail other means of local transport. Hampi is well connected to several places by the road network. There are many buses that ply between Hampi and a number of major towns and cities in Karnataka. Visitors can also hire private cars, cabs or other vehicles from major cities like Bengaluru (Bangalore) or Mysuru (Mysore) to reach Hampi.